Clearly his batting has evolved since he was given this esteemed role. But does an individual with individual gifts honed to excellence automatically make a good leader? As a leader it is important to avoid hypocrisy. For example a younger Michael Clarke placed Lara Bingle above a team function (and rightfully incurred the ire of Simon Katich) and an older Michael Clarke suspended his players for not complying with another team function. Leading people is not easy. Inspirational leadership can inspire people to die for their country. In the case of the military, Victoria Crosses are won by those prepared to sacrifice their lives for others. Conversely autocratic, fear-based leadership results in people doing the minimum to get by, and in some cases to rebel. In taking the extreme decision to suspend a player from playing for his country for failure to fill out a team evaluation form, Clarke has introduced fear as his major management tool. The question needs to be asked whether this would have happened had Clarke not also been a selector. Clarke has also displayed a level of vindictiveness in Simon Katich’s exclusion from the side, when he was one of the top five batsmen in the world, a position which has not been adequately filled since. After suffering a most humiliating recent defeat in India, a clear benefit for the selectors is that by suspending players has been to deflect any criticism for team selection and game strategy away from them and onto the players. Clarke needs to ask himself what he wants from his players, and in doing so how is he going to inspire them to do so. Respected for aeons as a great cricket nation, Australia has now become the laughing stock of the cricketing world. 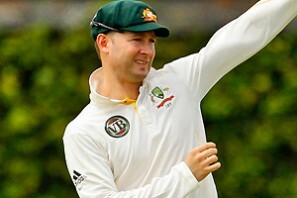 It is going to be a long way back from here for Michael Clarke and Australian cricket.